Who did Brendan Bracken and William Joyce see when they looked into the mirror? Two Irishmen, the first the Tipperary-born son of a militant republican father, the second an Irish-American, born in New York and raised in Galway? Or two self-styled upper crust Englishmen, prominent players on opposing sides of Second World War’s propaganda battle? In a traverse styled production, with the audience seated on both sides of Ciaran Bagnall’s polished wood staging, which can risk the loss of lines. Nevertheless, in the central casting, Ian Toner deftly handles the intense, angry verbal war which lies at the core of Thomas Kilroy’s Double Cross. Director Jimmy Fay employs gauze screens and projected news footage to bring the social climate of the 1940s into focus. It soon becomes evident, however, that this 32 year-old play, with its themes of identity, political expediency, rising right wing nationalism, fake news and media spin is an anthem for our own troubled times. With engaging vocal and physical delicacy, Toner portrays Bracken as an insecure, sexually ambiguous political operator with a faux accent and a ludicrous wig. He morphs onstage into the figure who haunts him and is powerful as Joyce’s eerie alter ego Lord Haw-Haw, whose broadcasts from Berlin sent fear across the Channel but whose acquisition of British citizenship set him up for execution. Charlotte McCurry crisply covers the female roles, the most rounded of which is Joyce’s single-minded fascist wife Margaret. 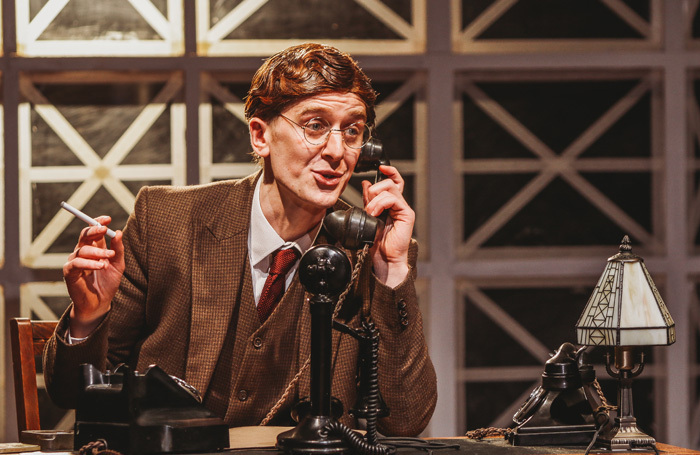 The versatile Sean Kearns skilfully spans class and nationality divides as Lord Beaverbrook, a London fire warden, bumbling German Erich and a menacing Nazi officer.